Practice Analytical Instrumentation questions and answers for interviews, campus placements, online tests, aptitude tests, quizzes and competitive exams. This set of Analytical Instrumentation Multiple Choice Questions & Answers (MCQs) focuses on “X-Ray Fluorescent Spectrometer”. 1. Which of the following components of the X-ray fluorescent spectrometer induces fluorescent radiation? Explanation: Excitation source induces fluorescent radiation in X-ray fluorescent spectrometer. A mono-energetic source is required for this purpose. 2. Why is a mono-energetic radiation source required in X-ray fluorescent spectrometer? Explanation: Mono-energetic radiation source is required in X-ray fluorescent spectrometer to reduce unwanted background. This occurs due to the scattering occurring over a broad range of wavelengths. 3. Which of the following does not make the X-ray tube nearly monochromatic? Explanation: Slits do not make the X-ray tube nearly monochromatic. The most commonly used source is X-ray tubes. 4. 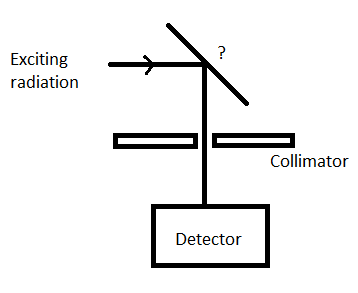 Which of the following components make use of a thin metal foil to isolate a nearly mono-energetic excitation beam? Explanation: Filters make use of a thin metal foil to isolate a nearly mono-energetic excitation beam. Nickel is one of the metals that is used in filters. 5. Energy dispersive system uses which of the following detectors? Explanation: Energy dispersive system uses semiconductor detectors. It consists of an excitation source and a sample. 6. In Energy dispersive system, the energy level and the number of pulses is related to which of the following? Explanation: In Energy dispersive system, the energy level is related to the element involved. The number of pulses is related to the concentration of the element involved. 7. The analysis of X-ray beam by diffraction is similar to spectrum analysis carried out with a diffraction grating. Explanation: The analysis of X-ray beam by diffraction is similar to spectrum analysis carried out with a diffraction grating. Wavelength dispersive type of meter derives its name from this fact. 8. The crystal used as X-ray grating has _______ dimensional lattice arrays. Explanation: The crystal used as X-ray grating has three dimensional lattice arrays. Photons can be coherently scattered using the crystals. 9. Which of the following can be done to avoid loss of intensities of X-rays due to the absorption of long wavelength X-rays? Explanation: Air in the chamber must be replaced by helium to avoid loss of intensities of X-rays due to the absorption of long wavelength X-rays. Vacuum chambers can also be used. 10. In curved crystal arrangement, angular velocity of the crystal is twice that of the detector. Explanation: In curved crystal arrangement, angular velocity of the detector is twice that of the crystal. This arrangement is suitable for the analysis of small specimens. 11. Which of the following is the disadvantage of silicon semiconductor detector? Explanation: The disadvantage of silicon semiconductor detector is that they can be operated only at low temperatures. They have high stability, high count-rate and adequate resolution. 12. Given below is the diagram of energy dispersive system. Identify the unmarked component. Explanation: The unmarked component is specimen. This system consists of source, sample and detector. 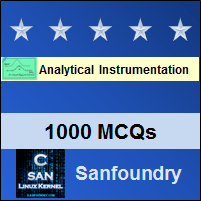 Sanfoundry Global Education & Learning Series – Analytical Instrumentation. To practice all areas of Analytical Instrumentation, here is complete set of 1000+ Multiple Choice Questions and Answers.